The GableGotwals staff and attorneys can be regularly seen volunteering to read to children, serving on a variety of not-for-profit boards and participating in civic and community events. 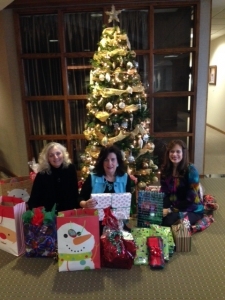 Recently, the Tulsa office concluded the Firms best ever United Way drive and then adopted an Angel Tree Family through the Tulsa County Bar Foundation to help spread the holiday cheer. Pictured are Shelley Bradley, Linda McCormack and Doria Custer who coordinated the drive.